Germany has seen a big drop in the number of migrants accepting financial support to leave the country voluntarily. Last year, 15,962 people left under the program, almost half as many as in 2017 and about a third of the number the year before that, according to the German interior ministry. Under a German government program, asylum seekers and those who have been granted certain forms of protection in Germany are eligible for financial assistance if they choose to return to their country of origin or another country, but can't afford to do so. The program covers travel costs, medical fees and financial start-up assistance. How much and what type of support can be claimed depends on the person's nationality and other criteria. The rate at which migrants are being deported from Germany is also decreasing, though only slightly, the news agency KNA reports. The number of forced returns fell from 23,966 in 2017 to 23,617 in 2018. Almost all of the deportees left by plane from German airports. The main groups to be deported last year were Albanians (2,207), followed by people from Serbia (1,455) and Kosovo (1,244) – all three are considered by Germany to be "safe countries." 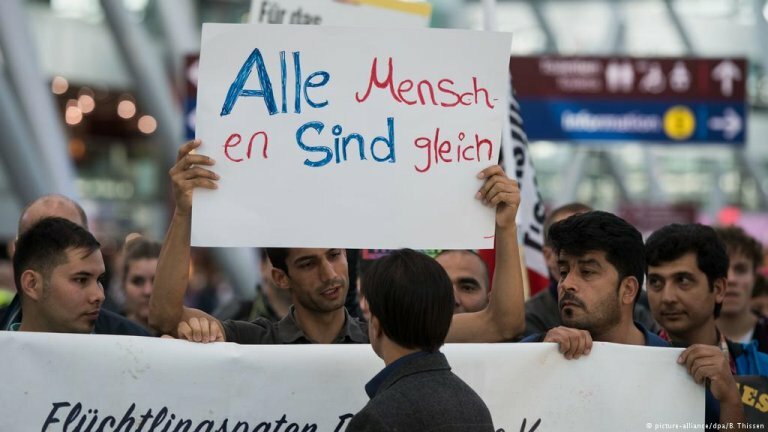 1,108 people were also forcibly sent back to Georgia, which the German government wants added to the list of safe countries, but has failed to get support from other parties in the Parliament. Because of the security staff needed to accompany the deportees, forced returns reportedly cost the country €8.2 billion last year alone. Many of them also went wrong while they were in progress and had to be abandoned. In more than 1,630 cases, the deportees resisted – mostly Nigerians, Somalis and Syrians, according to KNA. In over 500 cases, the airline company or crew refused to participate in deportations. Some returns were stopped on medical grounds and in 15 cases, the receiving country said it would not accept the returnees. At the end of 2018, just under 236,000 people in Germany had "removal orders," but 180,124 of those were given a suspension on humanitarian grounds. The German government has come under attack in Parliament. The left-wing party Die Linke says the high number of police deployed to enforce deportations is worryingly high. Spokesperson Ulla Jelpke also said rejected asylum seekers were not being given proper "humanitarian and legal treatment," and called for "more effective provisions on the right to remain and integration assistance for all."